Have you heard about the bi-monthy FREE live concert series in Old Oakland? We are already leading up to Session 5 in the series that takes place every 1st & 3rd Thursday at 9th & Washington Street. There is a stage and beverage tent and on the other side of the street is what is near and dear to me as a supporter of indie business. Are you a Lover of Oakland and eager to check out this new scene in the heart of Old Oakland? Stop by and say !Hola!, you'll find me staffing the Tamale Girl food booth at every date remaining including next August 7 from 5:30 - 9pm. Check out the other cool vendors and show some serious support for Oakland. BTW, my Tamale Girl booth will also be at next weekends LakeFest '08 on Lakeshore Ave August 2 & 3 along with 79 other vendors, live music and a kiddie carnival. 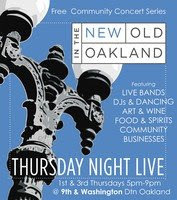 On behalf of Old Oakland Neighbors and Oakland Events, I'm writing today to let everyone know of a change regarding the Oakland Local First Marketplace during Thursday Night Live. Our goal was to have a Marketplace to showcase Oakland community and Indie businesses. As the organizers, we have concluded that this ongoing bi-monthly concert series is not the right fit for our local sustainable small business concept. Therefore, we are putting this Marketplace during TNL on hold indefinitely effective Aug 21. We truly appreciate our volunteers for their time, effort and support during the run of this Marketplace. Oakland Events has other special events in the works geared specifically toward local community, merchants and artisans including Out & About in Rockridge '08 (Sun, Sept 28) and Oktoberfest (Sat, Oct 4) in Dimond. For more information please go to oaklandevents.net.